1. Insulated curtains - These specialty items have a thermal foam backing that keeps the area around glass windows (poor insulators by nature) heated and insulated. They even come in pretty patterns. 2. 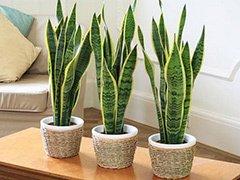 Indoor plants - The added oxygen circulation and moisture from keeping plants indoors will increase the energy efficiency of a home while adding an appealing natural touch to the décor. 3. Programmable thermostat - While most programmable thermostats are not cheap, the return on this investment will be well worth it, as the energy conserved by controlling the temperature of your abode even while away will add up to big savings over time. 4. Awnings - Adding awnings to a home provides protection to windows and doors that would normally be bombarded by the elements, and some awnings are retractable, which means they can even add to the insulation of a home. 5. Foam insulation - Unused rooms like attics and basements can be insulated with foam to prevent the central heating system from running too frequently. In addition to the draft found from these rooms, door stoppers can trap heat inside a house by preventing entry and exit doors from being too drafty. These five simple modifications will make you home virtually weather-proof by keeping things temperature-controlled, energy efficient, and most importantly, downright comfortable. Posted on March 24th under Global Ecology.